I am super excited about this project. I found the idea on a blog called Capture the Details about a year ago and I ran across it again yesterday. I know a lot of you are still trying to get rid of persistent snow – we’ve started having 100 degree days and sweating until we cave in and turn on the AC. 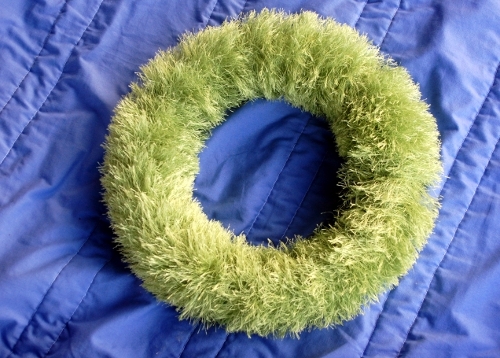 Either way I think all of us deserve a little soft spring grass. 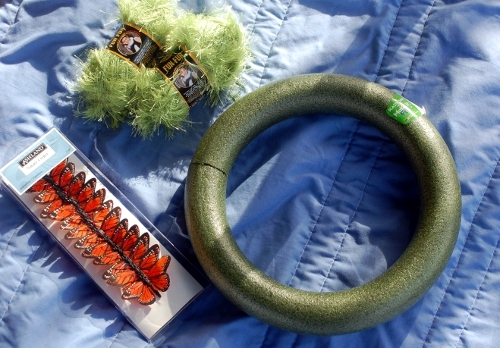 Fortunately, all you need is some green Fun Fur, some sort of wreath-type-shaped thing, and something to decorate with. 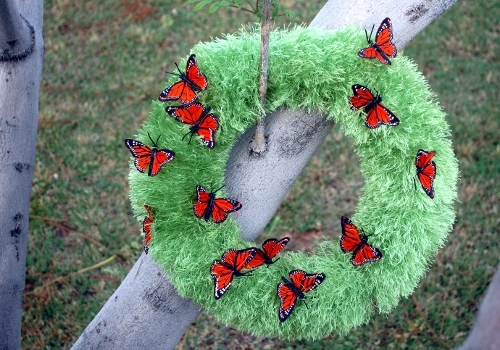 I found a pack of artificial monarch butterflies at Michael’s and I knew they would love to chill on the grass wreath. IT’S SO FLUFFY! Look, the green is a different color in every photo. Cool. 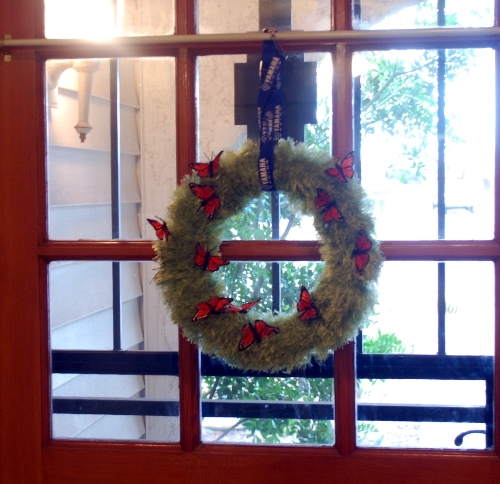 The butterflies had thin, flexible wires attached to them already, so all I needed to do was trim them down to about two inches and poke them into the wreath. Max and Charlie helped and it was fun all around. I think it’s beautiful. I also think letting the kids help place the butterflies helped them to look more natural and less staged – thanks, kids. Right now I’m hanging it on the inside of our front door from Greg’s Yamaha lanyard because I forgot to buy ribbon when I got the yarn. I know I have some ribbon around somewhere already…but for now I’m just happy to have a little bit of spring and some butterflies in my house. I love it! I made a mini Xmas tree with a cone and fun fur much the same way. I like the butterflies and “grass” much better though! I like the cone Christmas Tree idea very much.